Hillery had a splendid suggestion. For those of you that have found the site helpful and maybe made some money you can give back by donating a little something to my favorite charity. 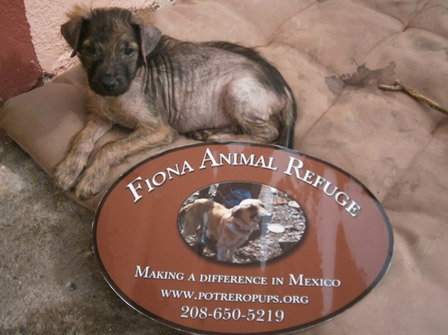 One of my best friends runs this clinic in Mexico for stray and abandoned dogs and cats. It just rips my heart out when I see how some of these poor animals have been treated. Many have been tortured and starved. Anything you can donate will be greatly appreciated. This entry was posted in Uncategorized on March 31, 2016 by Gary. SHORT TERM TOP COMING WITH EMPLOYMENT REPORT? If there is ever going to be a spot for a short term top in this stock market, in this case a daily cycle top, tomorrow’s employment report should be it. Clearly, the market has been discounting a good number, and for the most part the jobs numbers have been coming in bullish for some time, so I’m not expecting that to change. To a novice investor it probably doesn’t seem logical for the market to sell off on a good number, but that’s not how the market works. 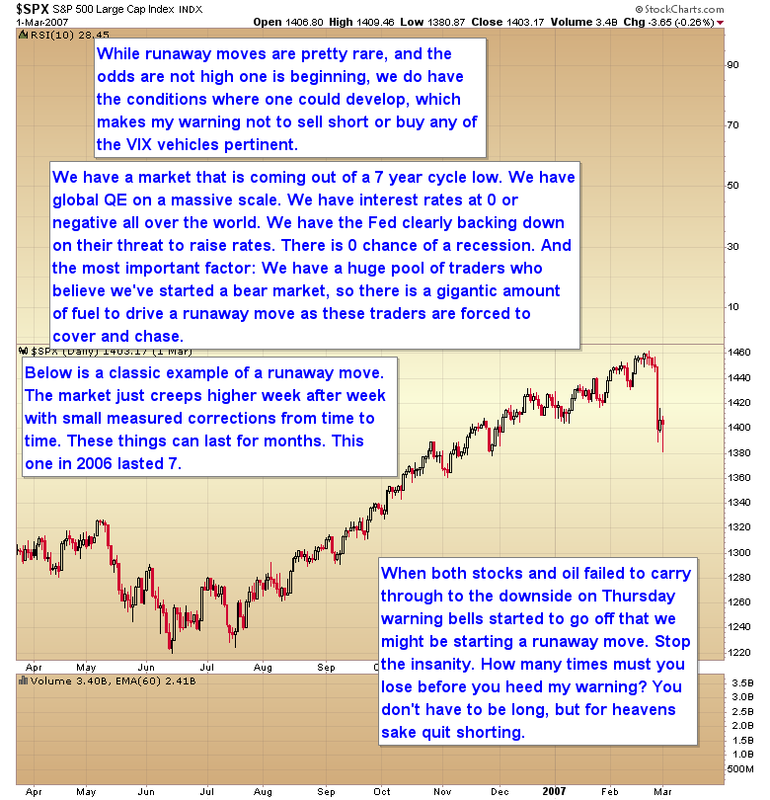 If the market has already rallied ahead of the number then the smart money will sell into an initial gap up open and that will start a profit taking event – thereby creating a short term top. And really, that is how moves into a daily cycle lows are begun. 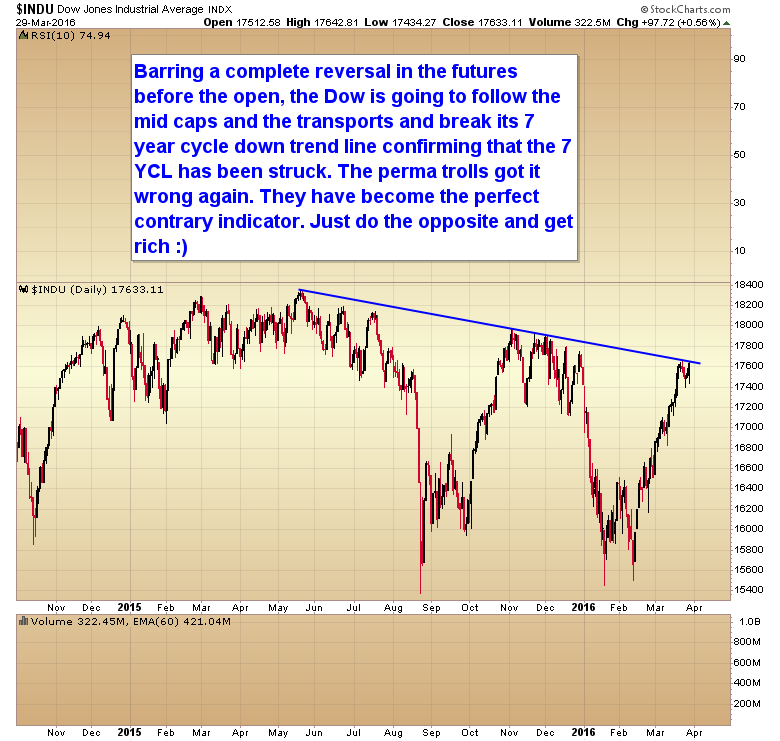 Daily cycle tops and their ensuing correction are profit taking events. 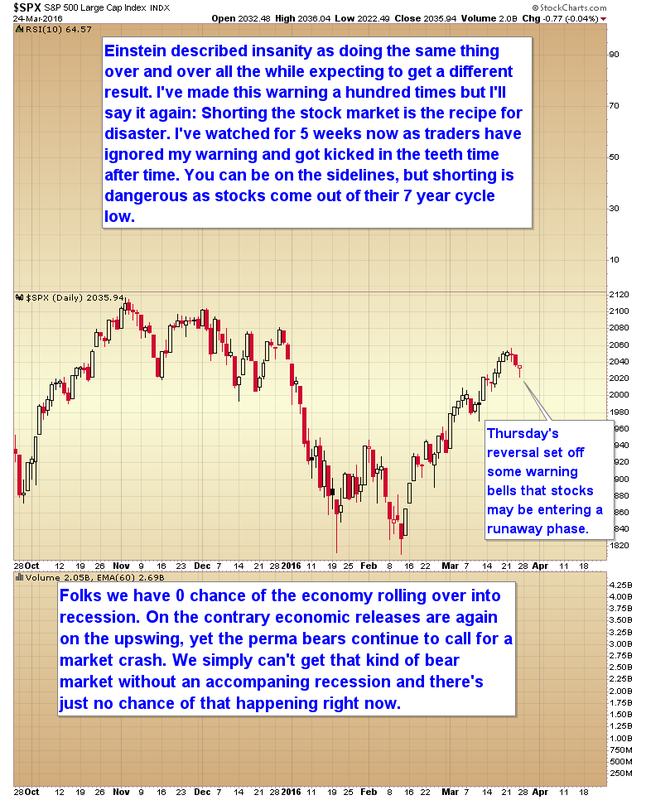 A correction that begins on a good economic number doesn’t mean the market doesn’t believe the number. 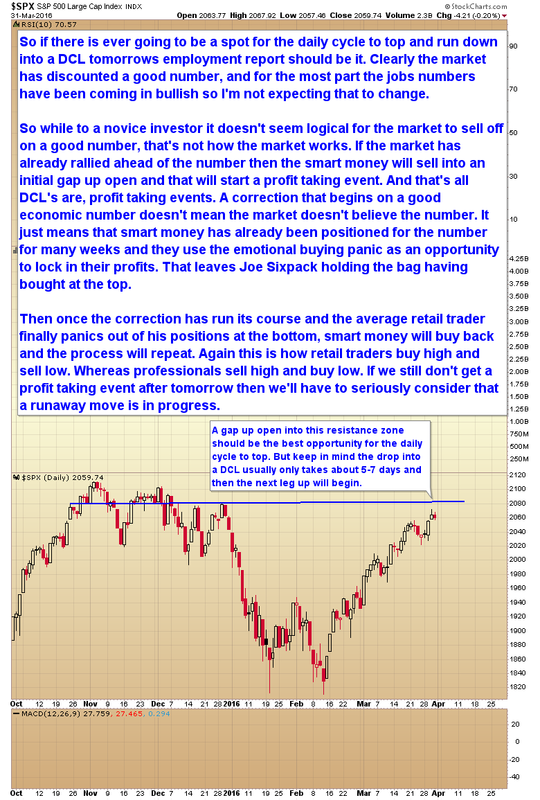 It just means that smart money has already positioned for the good number of weeks in advance and then use the emotional buying panic as an opportunity to lock in their profits. This leaves Joe Sixpack holding the bag as he has once again bought at the top. Again, this is how retail traders buy high and sell low. Whereas professionals sell high and buy low. If we still do not get a profit taking event after tomorrow then we’ll have to seriously consider that a runaway move is in progress. Back by popular demand (like who isn’t in favor of a discount). For new subscribers only. Good today only. 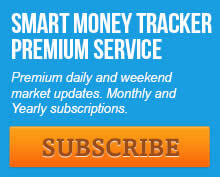 Buy a yearly subscription to the SMT and I will rebate $50 back off the subscription price. Just click on the orange link at the top right side of the blog or click here to go to the premium website to register. Choose the one year subscription, complete the payment process and I will refund $50. While all the technical traders have been busy assuring me I’m wrong and the stock market is about to crash, we see again today that technicals are useless as the market comes out of the 7-year cycle low. A runaway market is close to being confirmed. Quit wasting your time following these people. 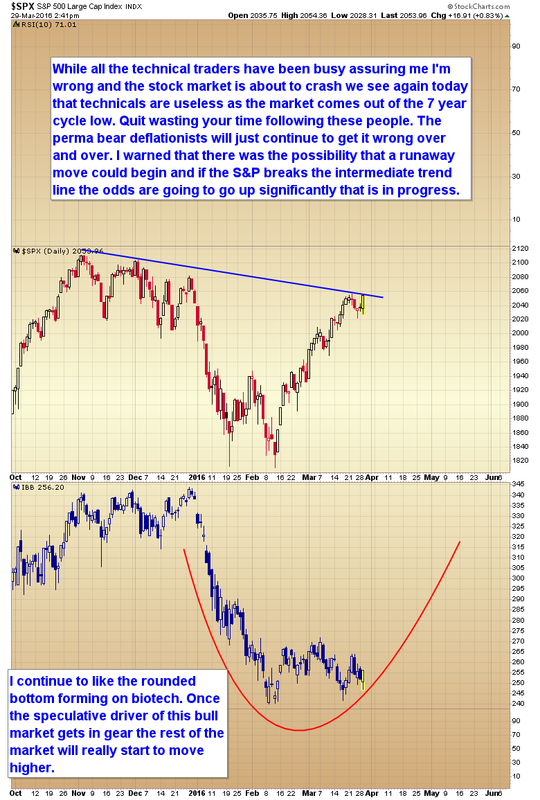 The perma bear deflationists will just continue to get it wrong over and over. I warned that there was a possibility a runaway market could begin and if the S&P breaks the intermediate trend line the odds are going to go up significantly that outcome is in progress. I continue to like the rounded bottom forming on biotech. Once the speculative driver of this bull gets in gear the rest of the market will really start to move higher. This entry was posted in Uncategorized on March 29, 2016 by Gary. 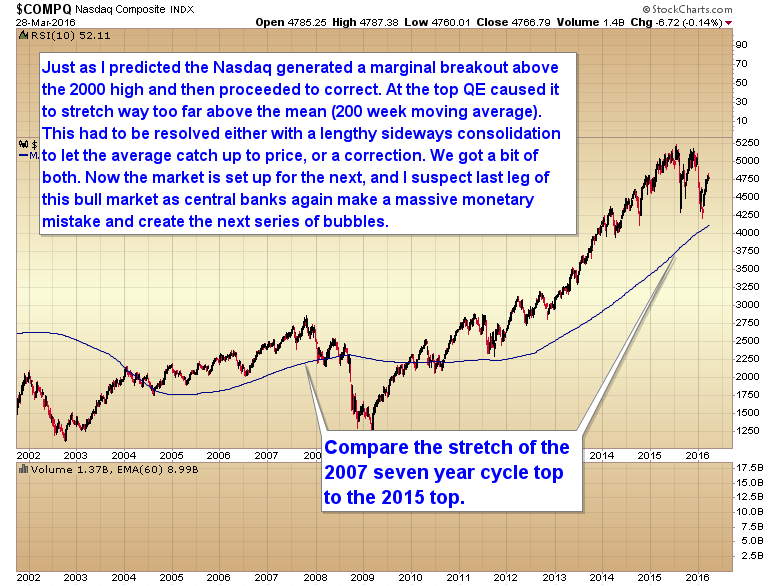 Just as I predicted the Nasdaq generated a marginal breakout above the 2000 high and then proceeded to correct. At the top QE stretched the market way too far above the mean (200 week moving average). This had to be resolved either with a lengthy sideways consolidation to let the average catch up to price, or a correction. We got a bit of both. Now the market is set up for the next, and I suspect last leg of this bull market as central banks again make a massive monetary mistake and create the next series of bubbles. This entry was posted in Uncategorized on March 28, 2016 by Gary. 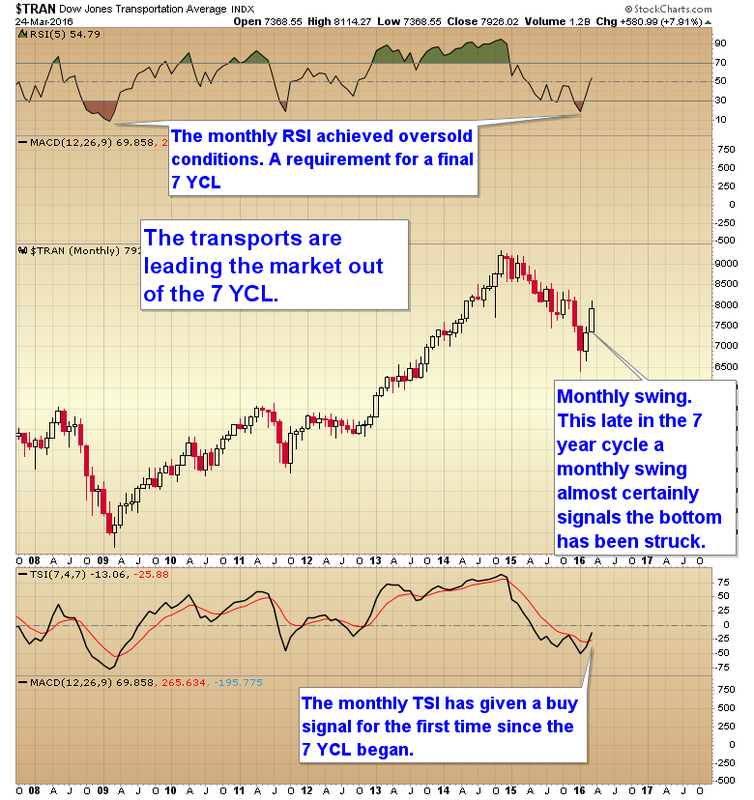 The transports are leading the market out of the 7 year cycle low. 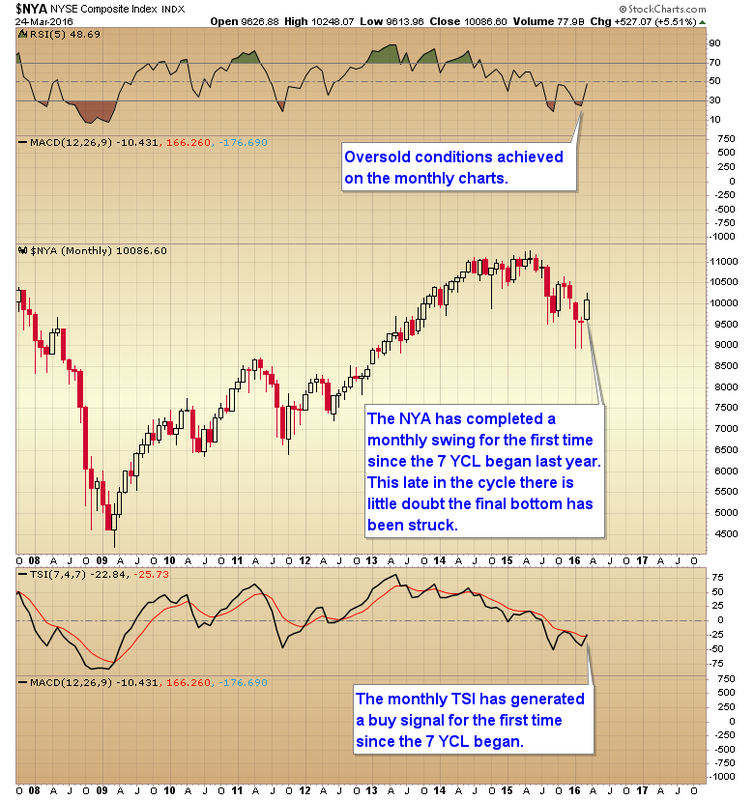 The NYA has completed a monthly swing. 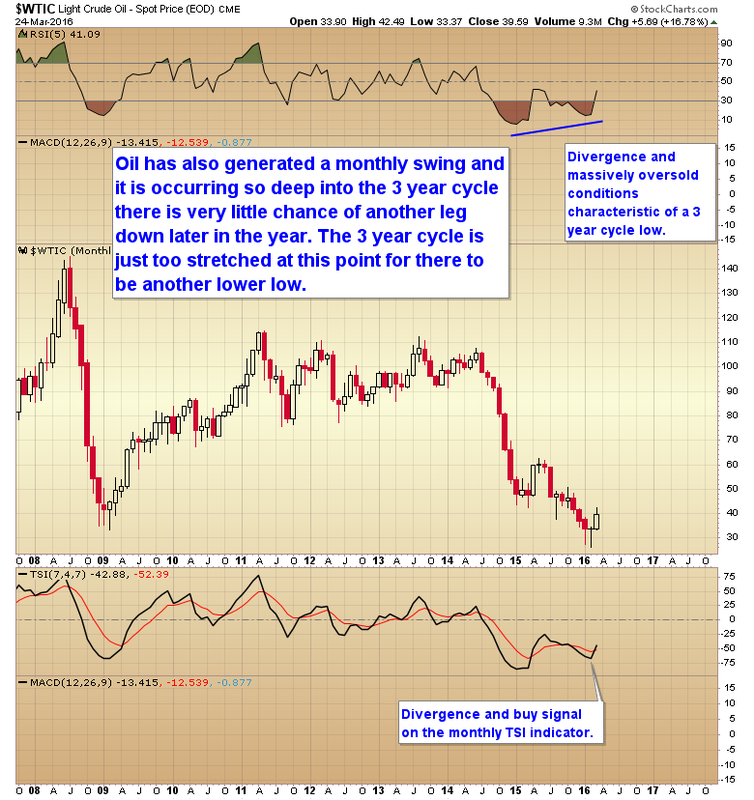 The oil market has also generated a monthly swing very late in its 3 year cycle. The 3 year cycle is just too stretched at this point for there to be another lower low. Like I’ve been saying for a long time: It’s time for everything to rise together. Well almost everything. 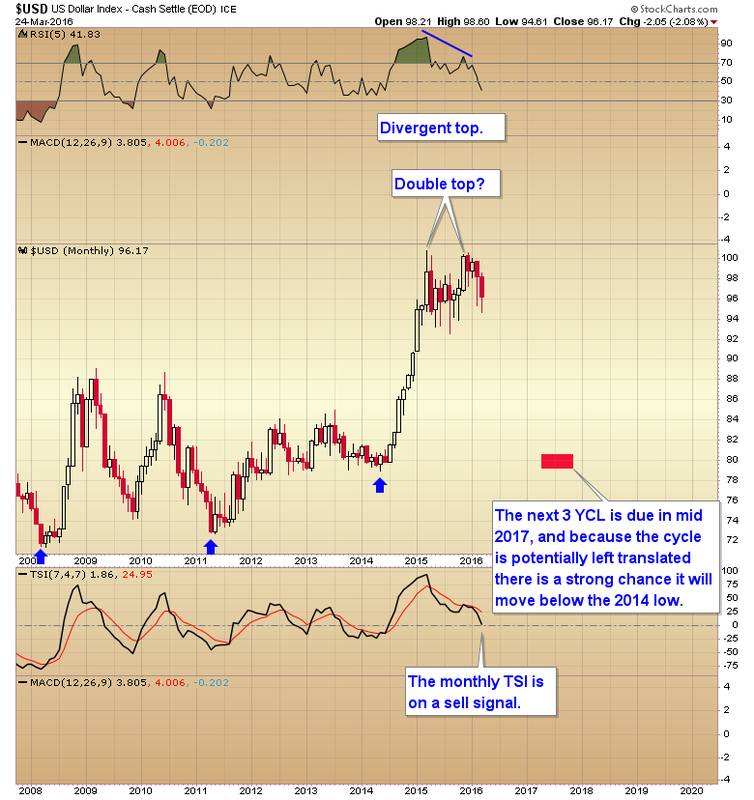 The monthly dollar chart is exhibiting a possible double top. Price is not expected to bottom until mid 2017. This entry was posted in Uncategorized on March 27, 2016 by Gary. While I’ve done my best to try and dissuade people from selling short, there are always going to be plenty of traders that insist on doing things the hard way. If you are determined to make it as hard as possible to turn a profit then at least have the patience to wait until you have the odds as far in your favor as possible. 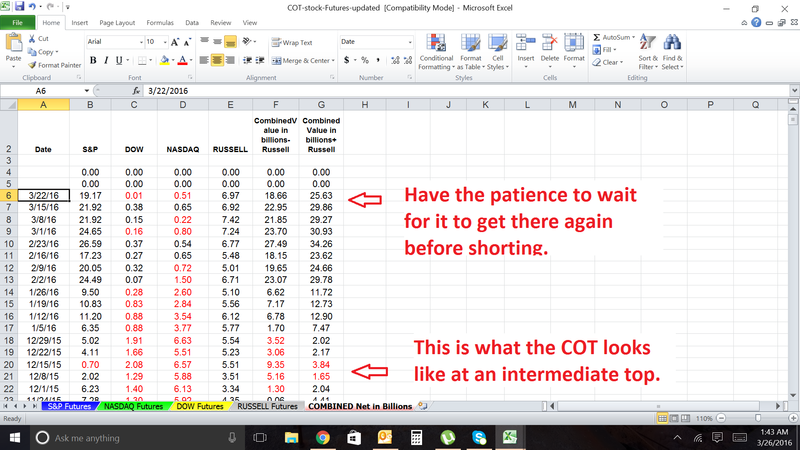 I would argue that the COT reports are your single best tool to time short entries. During gold’s baby bull rally I saw trader after trade try to be a hero and pick a top. Invariably every one of them ended up like a bug on a windshield. Why? Because they tried to sell short too soon. Over and over I cautioned that almost no intermediate cycle in gold ever tops until the total commercial short position rises above 300,000 contracts. If traders had paid attention to that one simple rule they could have saved themselves a lot of pain. Just as I warned, gold kept ramping higher and it wasn’t until three weeks ago that the COT reports for commercial short position reached the 300,000 contract level. I still maintain that selling short is a very difficult way to make money. But if you just can’t resist flying into the fire at least wait till the COT reports reach levels in your favor. 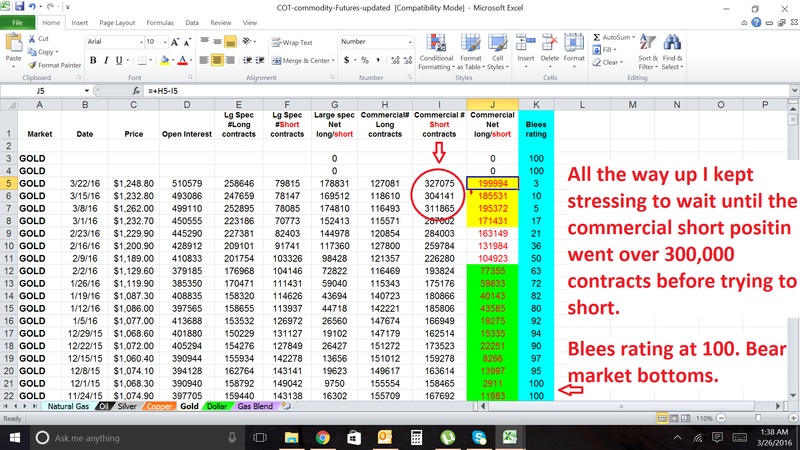 Now that the commercial short position has moved to 327,000 contracts it is safer to short gold. Personally I just use the COT reports to tell me when to take profits, I have no interest in trying to short. 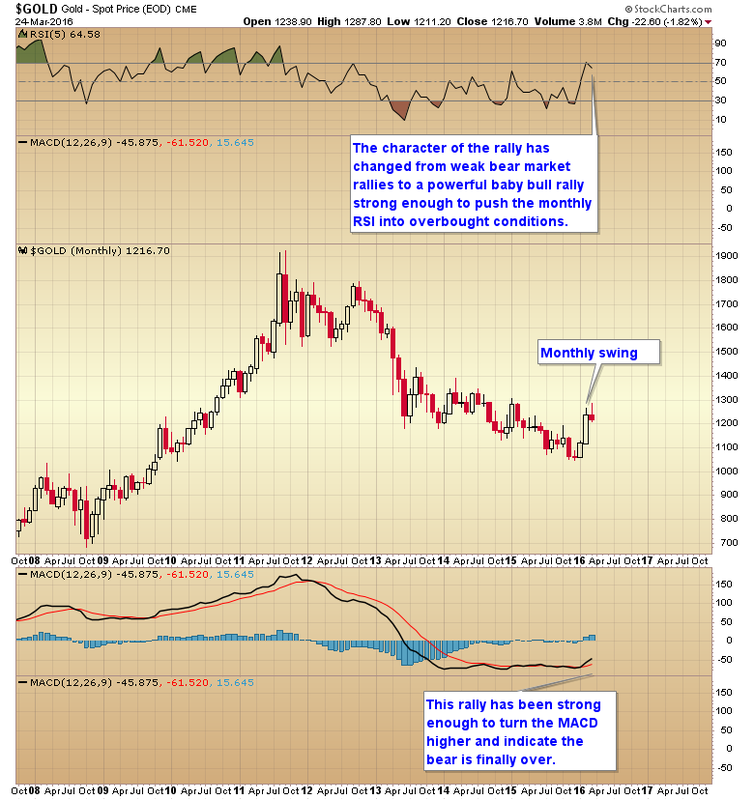 Even if gold is ready to drop into an intermediate cycle low I suspect the nature of the market has now changed and it’s going to be a very erratic move that will likely chew up bulls and bears alike. By that I mean it could take 5-7 weeks to complete the ICL and gold may only drop 50-70 points during that period. Why fight with a market for such small percentage gains? Now I’m seeing the same impatience when it comes to shorting the stock market. And you can use the same tool here to give you an edge and prevent losses by being too early to the party. At intermediate tops the combined COT index futures almost always reach single digits, or even slightly negative levels. Until they do the odds are that early shorts will lose money just like the early shorts in gold who failed to heed my warning. 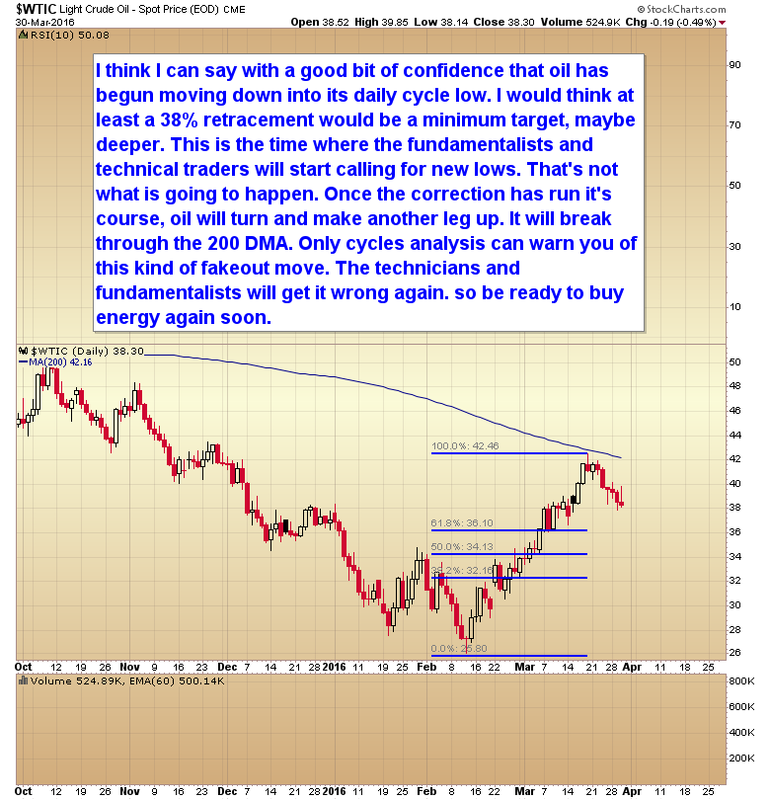 Pay careful attention to what these COT reports are telling us. As you can see in this week’s stock market COT report below, the commercials still have a long way to go before the odds swing in favor of shorting. Folks it’s not usually a good idea to stand in front of this train. Yes you may be able to day trade the short side and make some money, but if you are trying to pick an intermediate top it’s almost certainly too soon. I can’t stop the moths from flying to the flame, but if you will heed this one simple warning the odds of you getting burnt will decrease significantly. This entry was posted in Uncategorized on March 26, 2016 by Gary.